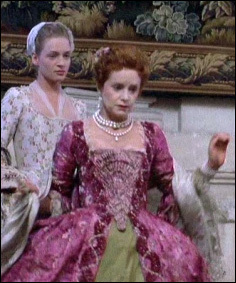 This gown has been used several times and was created by James Acheson for Dangerous Liaisons. 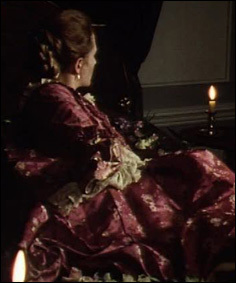 From there, he went on to design the gowns for Wuthering Heights, and so Anna speculates that while the gown was used for Clarissa in 1991, that scenes for Wuthering Heights were probably shot before the Clarissa scenes - at which point the gowns would have left the hands of Acheson and made their way to the BBC's costume house to be used in Clarissa. 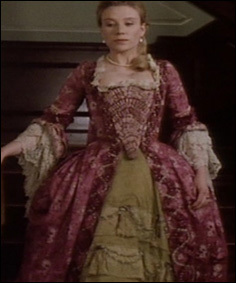 The gown is used twice in Clarissa - once on the main character, and then again when another character impersonates her in order to trick Lovelace. 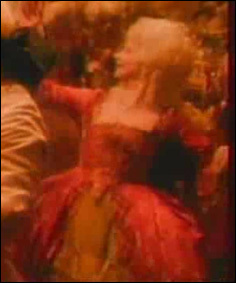 After that, the gown was used in the Annie Lennox music video Walking on Broken Glass, and then in the BBC's Tom Jones.